Join hundreds of thousands around the globe for this compelling discussion! This historic event will be attended by hundreds of thousands of people of diverse cultures, religions, and ethnic groups representing communities from around the world. People themselves are initiating this momentous event with the goal to raise vital questions that concern topics of peace, humanness, and empathy. We will touch on the question as to why we have such world problems as wars, international conflicts, racial and religious discrimination, misinterpretation of information by mass media, consumer-oriented society, etc. This is a pivotal opportunity on such a significant scale for humanity to look into the eyes of each other and unite, not only in words, but in deeds. 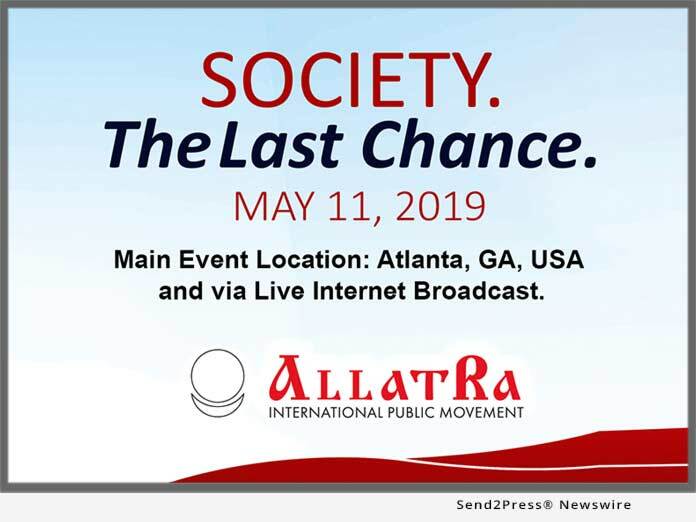 People will gather in Atlanta as well as conference halls around the world and connect to the Atlanta event via live internet broadcast. Journalists and mass media representatives will also be present in many countries. We invite all people of goodwill to join us in Atlanta, USA or via live broadcast! ALLATRA International Public Movement is a format of interaction outside of politics and religion. This global Movement, already joined by millions of people from over 140 countries, is open to all people of good will regardless of their place of residence, nationality, social status, religion or political affiliation. The activities of this volunteer, all people’s movement, are aimed at reviving spiritual and moral values in the world community and establishing a peaceful dialogue around cultural, social, spiritual and moral conditions of life within society. This is a unique, peaceful global movement in which people, in their spare time, successfully implement an entirely new form of communication, an interaction which results in the unification of people around the world based on the principles of honesty, kindness, and justice. ALLATRA International Public Movement is a format of interaction outside of politics and religion. This global Movement, already joined by millions of people from over 140 countries, is open to all people of good will regardless of their place of residence, nationality, social status, religion or political affiliation.